Back in June, I boarded a plane with a group of my friends to spend a couple of days at my friends’ (Grant and Patty) house on Georgian Bay in Canada, a place they all refer to as The Cottage. 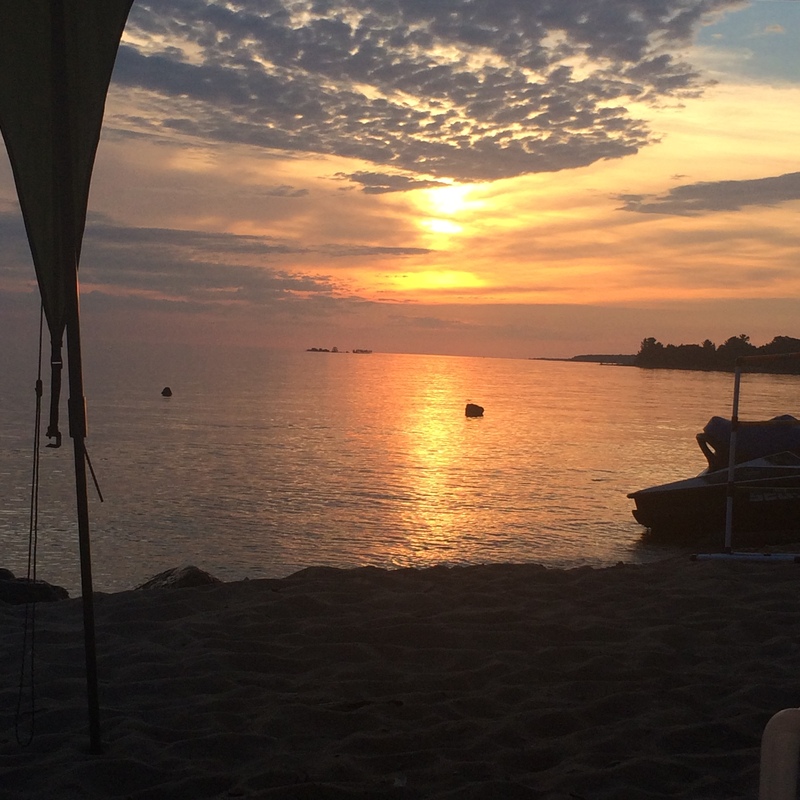 I had been looking forward to this trip for weeks, a true vacation by the lake, relaxing, eating, and drinking. But I brought with me on that plane a little dark cloud that I couldn’t ignore. The day before I had received news that my friend Sheila from Seattle had taken her own life. I had met her on my study abroad program to Prague. The 22 of us that were in the Prague program bonded to each other and became close. I had lost touch with Sheila and had last seen her a couple of years ago when her and some other Prague friends visited New York. But hearing of her passing left me heartbroken. I thought about her family and those that were close to her, and I can’t imagine how much they hurt, dealing with this great loss. So, I found myself in a foreign country, next to a beautiful lake, with friends who were eating, drinking, playing in the water, and laughing. But all I could think about was the funeral taking place in Seattle. I thought of my memories of her and tried to make sense of tragedy. There were a lot of people I had never met at The Cottage, friends of Grant from Quebec. And as always happens with new people, they asked me about the tattoo on my foot. It’s a factor in my life, explaining to people what it says, what it means. My answers are so rehearsed, they flow from me without thinking. I looked down at my tattoo and felt the same words tumble from my mouth, “life indestructible, always triumphant.” But something struck me, and I remembered why I got the tattoo. It was the magic of the city of Prague, it was the book I read “Under a Cruel Star” with the above quote, it was the people I met there that changed me. Sheila was a huge part of that. She was kind, welcoming, adventurous, and fun. And I wanted to be like her. One night in Prague, a small group of us were at an underground, Jazz bar in Prague when I recognized a group of Irish poets across the way. I mentioned it, and Sheila grabbed her camera and insisted we go talk to them, invite them to share our booth. I refused. I wouldn’t do it. “I’m shy. I’m not like you guys. I can’t do it.” I explained. She replied, “Life doesn’t happen just sitting here, but I’m not going to force you.” After a minute of thinking that over, I swigged my Pilsner and told her I’d do it. What resulted was one of the greatest nights of my life. The poets came over to our table and drank with us, entertained us with singing and Irish jokes. They walked with us along the river and took us to weird little comedy shows they knew of. My life from then on was different. I realized I didn’t have to be shy. I could be like the people I admired, like Sheila. I could chase after the things I wanted and be outgoing and love life. Prague became filled with so many amazing moments, so many involving Sheila. We danced on stage with a Reggae band to “No Woman, No Cry.” We stayed out all night drinking and dancing, and watched the sun rise over the Vltava. We bungee jumped off a bridge in Sokolov. We rode bikes for 70 miles through the Czech countryside. I learned so much from her about loving life, and I’m honored to have known her. And that was why I tattooed that quote to my foot. I always wanted to remember that in the face of tragedy and sad times, life was always there. I can’t make sense of her death, and my heart continues to ache for her family, but the only way to heal and to honor her memory is to live with the joyful spirit she taught me to have. So I continued to think of her as I swam in the lake, rode the jet skis, kayaked, sang songs around a campfire, laughed with my friends, played my first ever golf game, read a guilty pleasure book while digging my feet in the sand. The world lost an amazing person, and I hope that she has found peace and that somehow she knows what a positive impact she had on the people who were lucky to know her. 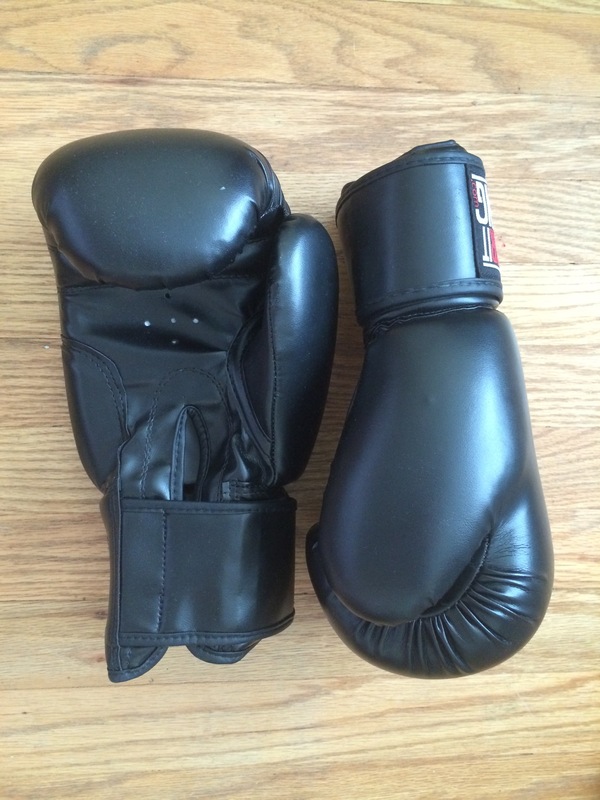 My gloves. They also came in pink, but I’ll always prefer black. A couple of weeks ago, I broke up with my significant other. It was something I knew had to happen and felt confident that it was the best decision to make. Between making the decision and when I actually got to sit down with him to do it, I had a span of four days to stew it over. In classic type A fashion, I spent a good amount of time researching tips to getting over break-ups, moving on, letting go, emotionally healing. Did you know that science has shown that what happens in the brain of someone who is going through a break-up is nearly the same thing that goes on in the brain of an addict going through withdrawals?! The brain begins to lack the pleasure-inducing endorphins that it was getting from the companionship. It causes depression, feelings of sluggishness and even physical pain. One way to combat this is with physical exercise. So I found a boxing gym close to me and signed up. My last couple of weeks have been flooded with work and amazing friends buying me booze and listening to be complain/cry. But I have managed to attend two boxing classes. The first one was with five middle-aged Hispanic ladies. I felt right at home. None of them were exceptionally athletic, and we were all sweating profusely and making ugly faces while doing something like 100 squats. It was 20 minutes of cardio, 20 minutes of strength training, then 20 minutes of freestyle one-on-one time with a punching bag. The instructor showed me a couple of basic punches, and I worked on perfecting them. The class was perfect. I left exhausted and sore but with a clear mind and heart. The second class I went to was me and three dudes. It was the same instructor as before and, and he spent a lot of time focusing on helping me while the guys did their own thing. We did a lot less cardio and strength-training and spent over half an hour with the punching bags. I was happy just bouncing around, jabbing and hooking to my heart’s desire. But the instructor honed in on me and lectured me on self defense. At some point it wasn’t even about boxing anymore as he told me to punch with my nail’s facing my attacker so that I could get his DNA under my nails?!?! Whoah! I was just there for stress release, not to learn how to avoid getting dragged into an unmarked vehicle. I found myself biting my bottom lip to keep from laughing as the scenarios got more intense. I mean, I’m glad I have an idea now of what to do if someone tries to stab me from the side, but I don’t expect that to be happening any time soon. I guess no one does though. Our clinic works closely with a house-call vet in Manhattan. Since she doesn’t have an office, we take in a lot of her patients that need inpatient care. About two months ago, we took in a rescue dog that one of her clients had told her about. 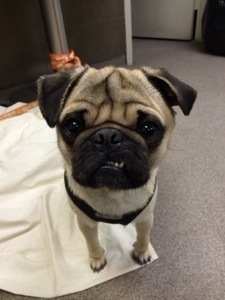 A 3-year-old pug named Earl who had been found in South Carolina, emaciated and covered in fleas. We took him in. After he was with us a week, he began having violent seizures. Two to three minutes long, full-body convulsions, foam seeping out of his mouth. It all became clear why such a beautiful dog had been thrown to the street. With a combination of medications, we got his condition regulated. But they had left him a little handicapped, mentally. He just wasn’t smart. He’d sit in his cage, kind of staring off into space. He’d chase his tail for a long time, getting to the point where he’d grab it with his mouth and stand still, unsure what to do next. Over the last couple of weeks, we let him out of his cage more and more, to the point where we set up a little bed for him in the treatment area, and we kept him out with us all day. Every once in a while, he’d have a day with clusters of seizures, but for the most part, he seemed fine. Then yesterday, on my day off, I get the staccato texts from Dr. L. Earl isn’t doing well. He’s having so many seizures. His temperature is 108. He looks bad. And finally, the one I was dreading, they had euthanized him. I sat alone in my apartment and wept for a dog that was never mine, but who I loved as much as if he were. Today was a difficult day. It was busy, but in our down time, we’d look to Earl’s empty corner and talk about how much we all missed him. We do this to ourselves over and over again. We let ourselves get attached to them. I don’t understand how we keep doing it. It’s easy to build up a wall against this sort of pain, to distance oneself from the possibility of getting attached, to falling in love. But then there are special souls out there who know how to find their way in to a blocked off heart. Earl was one of those. My girl sleeping. I didn’t want to open the cage and wake her. Shalimar started coming to us last winter. She’s a pom-mix, less yappy lap dog, more fox. She’s also a rescue from Arizona that around the office, became known as the foot dog. No one knows exactly what happened to her. The shelter that took her in found her wandering the desert streets, her paw pads scalded by the heat. But the radiographs we took show significant bone loss, and some have theorized that someone tried to declaw her by ripping out her nails. Either way her paws were severely infected with oozing drainage tracts on the tops and the bottoms of her feet. 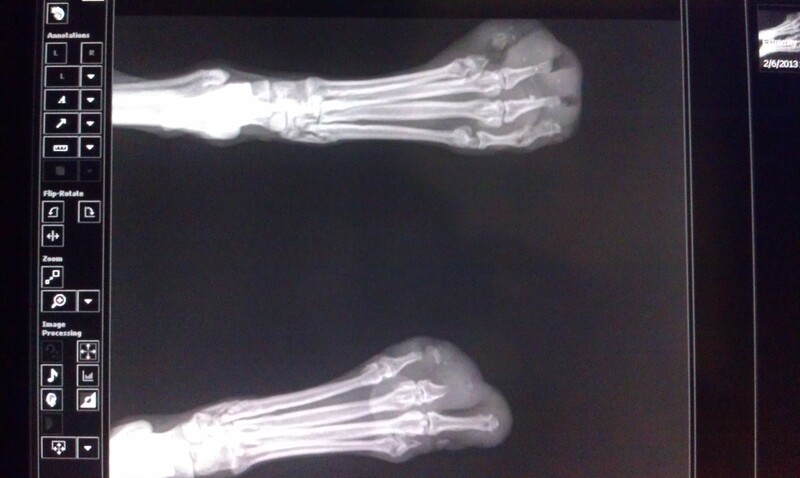 Radiographs of her back paws, with distal bones missing. The one blessing in this mess was that she seemed to have nerve damage to the point where she couldn’t feel her paws. She also happened to be the most stoic dog I’ve ever met. NEVER tried to bite, would only quietly cry in pain. Since her feet hurt, she liked to be held like a baby, feet up. Most dogs are hesitant to look you in the eyes, but she would focus her big brown eyes on yours. I adored her. We treated the paws the best we could, but the infection was aggressive and not responding to antibiotics. They’d get better, then they’d get worse. Her owner was particularly patient and loving toward Shalimar, never complaining to us about our inability to fix the problem. That only makes the situation harder for us as good clients are hard to come by. She deteriorated at a faster rate the last couple of weeks and Dr. L decided to admit her for heavy rounds of antibiotics and intensive nursing care. I took on a lot of her treatments and would hold her whenever I had some free time (which was not often this week.) Doing foot soaks can be a pain as animals flop around, splash water, want to escape. But with Shalimar I would hold her in my lap while her sad paws sat in the Epsom solution. She loved it and would often fall asleep as I held her paws in place. With gloves I would massage her feet in an attempt to reduce the swelling. One of the most disturbing things I’ve experienced as the paws would crackle like bubble wrap in my hands. A part of me wanted to title this post “Delusion.” Too often I see owners who keep their pets alive too long. They selfishly refuse to accept that their pet is suffering and only getting worse. It makes me angry. But over the last week I realized how natural that feeling of hope can be and how hard it is to let go of something you love. I held Shalimar so many times and felt her labored abdominal breathing (a sign of pain). I watched her struggle to walk, refuse to eat. But because I loved this dog so much, I refused to see it. It wasn’t until Saturday night when Dr. L upped her pain meds that I realized she would have to be euthanized, and soon. She was conked out from the morphine and finally feeling a little peace. It was so hard to be pulled from that delusion and see what was really in front of me, an animal in a lot of pain. I started to cry and ran into the bathroom to try and contain myself. I can’t say enough about how wonderful the owner was, how much she loved this dog and how reasonable she was. They euthanized my girl last night. I’m so sad about her being gone, but in that sadness I have to search for a little bit of happiness that we did the right thing. I enjoy writing on this site about my vet tech career, and I have spent the last couple of weeks brainstorming ideas for a post. The reason I haven’t written a vet tech post in a while is because it has been a rough couple of weeks at work. Lots of loss, lots of tragic loss, saying goodbye to patients that I loved, writing condolence cards to clients who I know are going through a painful time. It’s been consuming my work life, and if I were to write about it, this could become a rather depressing blog. 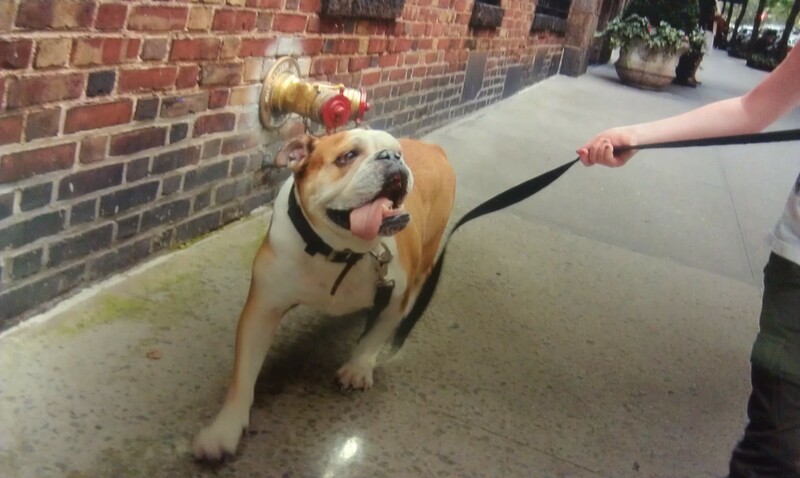 One of the most difficult losses was Prince Buster, a cheerful bulldog with a kind family. The owner adopted him years ago, and in the last couple of years has gotten married and had a charming daughter. Prince Buster was there through it all and a centerpiece of the family. 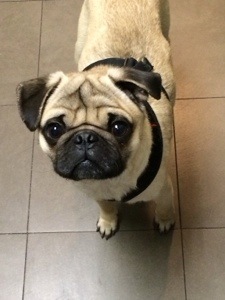 A couple of weeks ago, Prince Buster came in because he wasn’t “acting himself.” On a chance hunch, Dr. S tapped (stuck with a syringe) Buster’s stomach and pulled out non-clotting blood. This is a bad sign, it means that one of the organs in the abdomen is bleeding, this usually means cancer. He was rushed into surgery. The little family said their goodbyes and were told they could come visit after surgery that evening. Unfortunately, upon opening the abdomen, the membranes looked like ground hamburger, each tiny bulb was cancer. There were also large tumors suffocating most of the organs. They were metastatic, and they had won. Dr. S called the family and explained the situation. 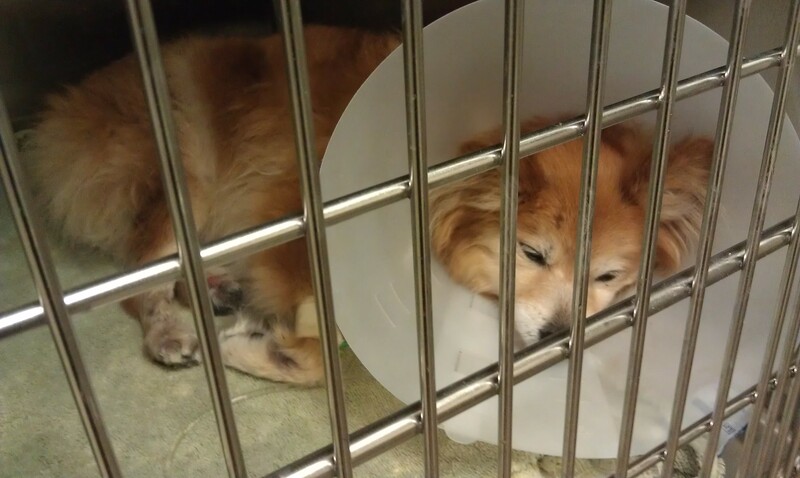 They wanted to come in to be with him for the euthanasia, but the doctor explained that he would only be in pain and that it would be best if he were euthanized directly on the surgery table. The family agreed but had one request, that the receptionist and technician that had known Prince Buster since puppyhood each hold a paw while he was euthanized. I stood in the doorway to the surgery suite and watched my co-workers hold those paws and cry. I thought of the little girl who had kissed her dog goodbye, I thought of the happy bulldog. It was a difficult day. That night I met up with a friend for drinks. I was running late and explained to her that I had a sad day at work. I told her the story of my day, how emotional the euthanasia was. “Why do you do this? !” she exclaimed at my sad story. I stumbled over an answer of there are good days and bad days, yada, yada, yada. But I didn’t have a clear answer. At the end of the day, I love my job and find it satisfying. I’ve never had a day where the sadness leads me to the thought that maybe I should do something else. But why do I put up with such a sad career? And just like that, I had my answer. I’ve never seen my job as a burden of dealing with death, but a privilege to be a part of their lives. The same day we got the card, we had a new kitten exam with a tiny Persian. I went to the room to grab her and said to the kitten, “Are you ready for your very first doctor’s appointment?” Her owners got all excited and began digging through their things for their camera. I didn’t mind as I posed for the picture with the kitten. I thought of the puppy pictures of Prince Buster we had in the back. One day that kitten will likewise pass away. We all know and understand that. But that’s not what’s important. Pets die, but we all continue to own them, love them, adore them. Because to be a part of their lives is worth it. For me to work on keeping them happy and healthy for as long as possible, it’s worth it.